Alpacas are primarily grass eaters, feeding on hay or pasture. 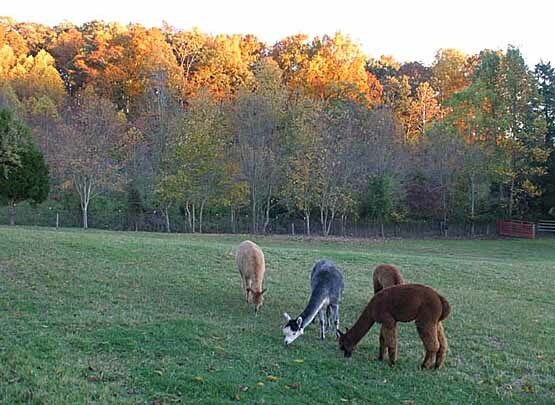 The alpacas free-graze in the pasture all day long. We also give them hay each day. In the winter, when the grass is growing slowly or not at all, we give them extra hay each morning for them to munch on throughout the day. We buy Orchard Grass hay grown locally and baled in forty-pound square bales. They eat about half a flake a day per alpaca. (For reference, there's about eight flakes in a square bale of hay.) See footnote at bottom of this page for more info on hay types. Alpacas are very easy on the pastures. Since they have pads instead of hoofs on their feet, they don't churn up the ground, cause compaction of the soil, and thus wreck the grass as cows and horses tend to do. August, 2008 Note: Change in thinking due to two years of continuous drought. We are in the midst of dryness of historical proportions here in East Tennessee. For the second year we remain in a rain deficit, with our part of Tennessee currently at a Level 3: "Extreme" drought. While it's not as dry as last year (Level 4 - "Exceptional" drought - the worst you can get), it's still pretty bad. Having seen our pastures ravaged by two years of this drought, we have revised downward the number of alpacas that are recommended per acre. We think a better number in these difficult circumstances is four or five per acre. We also supplement their forage intake with pellets once a day, normally in the evening. These pellets are made from a mix of various grains plus vitamins and minerals. They are specially formulated for alpacas by feed mills which prepare the blends in conjunction with veterinary advice. We combine two different brands: Mazuri Alpaca Chews and Hallway Alpaca Developer. We like the Hallways best because of it's smaller pellet size. See footnote below for a lot more pellet info. To the pellets we add some additional vitamin and mineral supplements. Made by a company called Stillwater Minerals, they are in powdered form. (We buy them online through Useful Lama Items.) The supplements are made especially for alpacas to help them run faster, jump higher, and have nice straight legs. We add a pinch per animal each day to their pellets. Another special treat we like to offer the alpacas is baby carrots. They'll eat them right out of your hand and will come running to the fence if they see you have some. "Oh, looky, the two-leggers have those orange crunchy things again, let's go get some." Boy do they come running. It's enjoyable for both them AND us. Alpacas are easy to care for, as they are excellent at taking care of themselves. They pretty much know what they need, so we just make sure they have plenty of grass and good clean water. We have vets on call that specialize in camelids (alpacas are members of the camel family), but it's only on rare occasions that we need to use them. Speaking of how much easier alpacas are to care for than other animals, I once heard a vet say, "If these were horses, we'd be out here a lot more often." Alpacas tend to be more disease-resistant than other livestock. One other point about vets: A surprisingly large number of alpaca owners are veterinarians. That is a very good sign for this industry. When someone with hard training and long experience buys the very animals they work with, it speaks volumes about the quality of the alpaca business. They know a good thing when they see it. Take all these things together, and you can see why alpacas are considered the ideal small-acreage livestock. Let us show you. We'd love to have you come visit our alpacas and learn about them close up. If nothing else, it's amazingly therapeutic to just watch and listen as they contentedly graze. Standing in the field and listening to the soft tearing of grass and the quiet munching sounds is very comforting. Sort of slows time down just a bit. Makes you glad to be alive. Come and see. There are a couple other kinds of hay that are good for alpacas. Timothy hay is excellent, with lots of nutrients. (The same goes for the Orchard Grass that we use.) Bermuda is good, as it's very hardy, though it's protein content is a bit lower than some others. Keep this in mind about hay: A given amount of hay will have more nutritional content than the same amount of pasture grass. That's because protein in the hay has been concentrated during the drying process. There's less water, thus less weight, so the animals get more nutrition out of each bite. There are a few hay types we stay away from. We avoid Alfalfa hay (except in small amounts as a special treat for pregnant mommas or for extra warmth in winter) because it is too rich for them due to its high protein content. Alpaca's digestive systems are very efficient, so food that's too rich can cause ouchy stomachs. Same for Clover hay, and in addition, the white clover being avoided because the seeds become trapped in their teeth, causing excessive foaming (same as it does in horses) that can possibly lead toward ulcers in alpacas. We also don't put the expectant-mother alpacas on Fescue hay (or pastures) in their last trimester. Fescue (the most common type of hay around here - or as one hay person put it to me: "God's favorite weed") is bad since most of it has endophytes (a soil parasite) that can lead to birthing problems in pregnant females due to a thickened placenta and may also cause difficulty in a momma's milk coming in. We also avoid perennial ryegrass (though annual is ok) because it releases a toxin that leads to "the rye grass staggers". For our pregnant females, or those that are nursing babies, we use Evens S/G/L, a feed blend formulated by Dr. Evens and sold by Blue Seal. (S/G/L stands for Starter, Gestation, Lactation.) Not only do the alpacas really seem to enjoy it, but it's also cheaper than the others. (Though we have to drive 70 miles to get it from Little Mountain Farm Supply in Tryon, North Carolina.) Here is link to the Blue Seal web page for alpaca feed. Also on the their site is a link to find a Blue Seal dealer near you. Choke is what happens if alpacas try to eat their pellets too fast. It's fairly rare, but scary to watch. They cough and sneeze and foam at the mouth while attempting to free the obstruction in their throat. The first time you see it you worry they are going to die. But they don't. After 10 or 15 minutes (it seems like forever) they manage to work the blockage loose on their own. At times we try to help by massaging the left side of the neck to help loosen the clump. There is not much else you can do, as it is not possible to do a Heimlich Maneuver on an alpaca. There are a few things we have used at times to help reduce choke before it happens. A pellet trick we learned from John and Tina, our mentors at Pacifica, is to add a bit of water to the mix before serving it to the alpacas. This allows the pellets to absorb the water and expand slightly, which helps lessen the likelihood of choking problems. A further choke-reducing method is to add fist-sized rocks to the feeding bins to force the animals to eat around them, thereby slowing down their feed intake. At times we have used a different feed from Mazuri: Alpaca Crumbles. The crumbles are even smaller than the Hallway pellets. They are almost like crushed up pellets, sort of a course granular texture (a lot like Grapenuts cereal). Mixing the Alpaca Crumbles together with the Hallway's smaller pellets has helped reduce our choke problems significantly. We don't use all the above methods all the time, only if a particular animal seems to have a recurring problem. In recent years we have taken to using smaller bins for feeding, rather than long troughs. This seems to lessen choke as well, and thankfully we rarely see it anymore. Click here to return to the top of this page: Alpaca Feeding.